We've had a beautiful winter in Helsinki this year. Lots of snow everywhere, trees covered in frost, icicles hanging from buildings, ski tracks on the frozen sea leading to nearby islands. 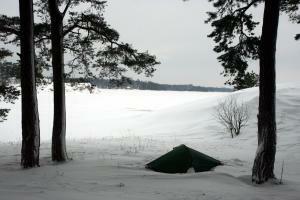 The photo on the right is from a weekend camping trip and I compiled a Winter 2010 in Helsinki photo gallery. The ground got covered by snow already in December and temperature has stayed below zero continously for two months now. In the city snow tends to get dirty but almost every week we've seen new, fresh, lightweight snowflakes falling down and making everything white again. Some people are complaining it's already too much but I think it has been an amazing winter. Streets are lined with snow walls and some parking places have been converted to more than two meter high piles of snow. Cycling to work has been tricky and required extra time on some mornings, but usually by afternoon also the main bikeways have been cleared already. Smaller streets have seen snow tractors less regularly, but overall the city street maintenance has done a good job. Perhaps a little surprisingly, railways have had the biggest difficulties to cope with the snow: many trains have been cancelled and others have been late. Sandra was here for one week and brought also her skis so we could go cross-country skiing together. We packed our backpacks full of warm clothes and food and headed out on the sea. After crossing Laajalahti bay from Munkkiniemi to Lauttasaari we continued about one kilometer further south to Käärmeluodot, a group of three small uninhabited islands which belong to the city of Helsinki. There's no regular ferry route even in the summer so the islands are only accessible by canoe or small boat. Camping is allowed. 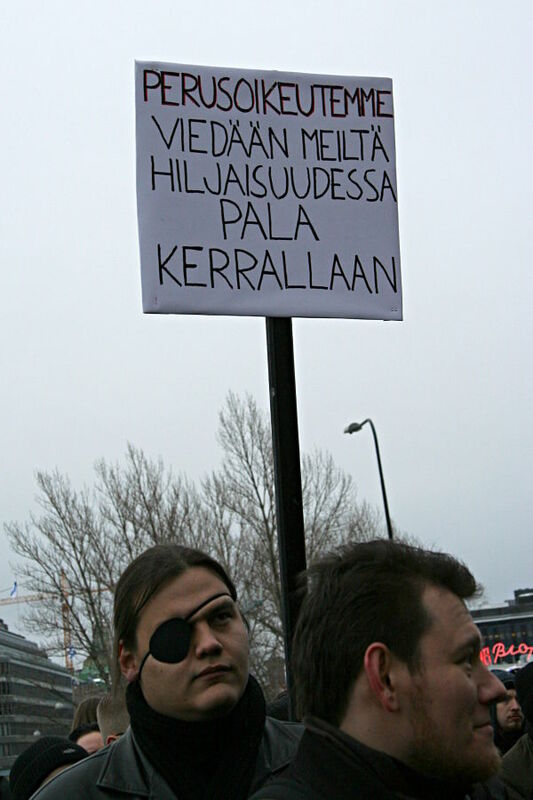 I had actually never been on Käärmeluodot, but I knew from the outdoor map that there would be some basic facilities. Two of the islands had a cooking shelter and one of them was in use also during winter time, with free firewood provided by the city. A couple of other skiers were having a break and there was even a fire ready when we arrived. However, it didn't take long until we were alone — only 5 km from city center and 1 km from densely populated Lauttasaari — but far away from city life. We cooked salmon and potatoes on the fire for dinner and set up our tent nearby. Later at night the wind became stronger and it started snowing again. The city disappeared behind a white wall and it felt almost like being in the wilderness. Our tent was well secured so we didn't have anything to worry about. I have winter pegs which are designed to hold the tent stable in the snow — the tiny summer pegs which normally come with tents are good for summer but useless in winter conditions. On the following day we had breakfast and skied back. Part of the way it wasn't really skiing but rather walking with skis through the new snow. 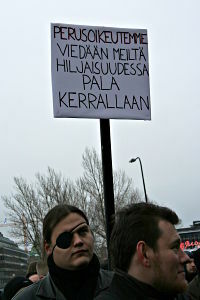 This time we took a different route towards Lehtisaari. There was some water on the ice near the shore and we had to make a small detour to avoid getting our feet wet. After that we felt we'd had enough exercise and took a bus for the last five kilometers home. 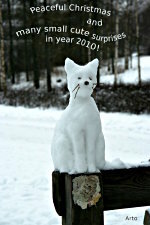 Last January, somebody had made a snow cat in the Helsinki central park. There it was sitting quietly on a wooden plank, smiling and looking at people passing by. I'm sure many of them smiled back and became just a bit happier because of the cat. During these days a large part of the world is celebrating Christmas, either as a religious event, a family gathering, a materialistic festival or all three of them. In Finland where I live it is common to go shopping for gifts and even feel stressed about finding the right gifts for right people. I admit that I did some Christmas shopping too. However, the snow cat reminds me that a gift can be anonymous, it doesn't require buying anything, it can be given at any time of the year and that small surprises in life are often the best gifts. With the cat, I wish all of you peaceful Christmas and many small surprises for year 2010! In late March, a white hall appeared on the Kaisaniemi field in the center of Helsinki. Inside in the middle of it stood a pile of one hundred tons of clay. For ten days, anybody could sign up as a volunteer, step in the hall and get creative. Over a thousand people participated, ranging from professional artists to random passers-by and small children. 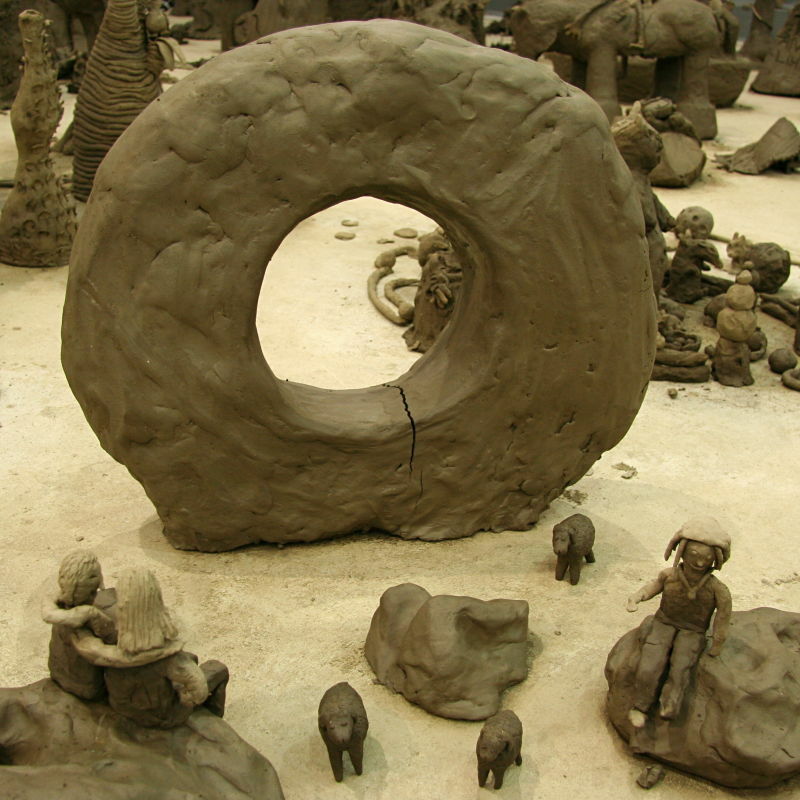 It was a collaborative art project called Clay and the Collective Body. The hall had no windows, simply white roof and light gray floor. 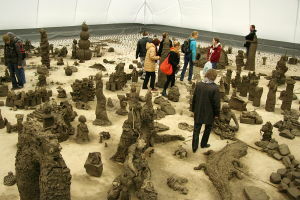 No cameras, mobile phones nor tools were allowed inside, just people and clay. The artist Antony Gormley wanted to make it a primitive experience: touch the earth and be a child again. It worked from the beginning — anyone could play that game, nobody needed to be told what to do. Antony said that many were a bit hesitant first but then got an idea or found others to work together with and became enthusiastic about creating something. Part of the idea was that one could build on what others had built and that produced some of the most interesting results. Someone placed simple blocks of clay after each other on one day, later someone else shaped one section of it to look like the Great Wall, a dragon head appeared at one end and fourth artist added some flowers on top. Most however chose an empty space and started working on something from scratch, either alone or in a group. We are taught to just watch and not touch the art of others and that behaviour can stick quite deep. After ten days the artwork was finished: doors were opened for public to walk around, view and take photos of the result. It was an amazing wealth of creative energy gathered in one place, reflecting all aspects of society. There were sculptures of people and animals, pictures of war and death, happy love scenes, historical buildings, items from recent news, realistic looking everyday objects, abstract shapes and surrealistic views. One could easily walk for two hours looking around and still find many unnoticed works and details during the next round. Now the doors have already been closed and the clay returned back to earth. It's similar to snowmen in the backyard and sand castles on the beach: no permanent objects to be preserved for years to come. However, there are plenty of photos and some videos on the official site of the project. The first photo in this blog entry shows an overview towards one corner taken from the center of the hall, and the second is the scene I made together with Sandra, a German girl who was visiting Finland. It was fun both to create and to admire what others had created. Clay and the Collective Body was the first project of the recently founded Pro Arte foundation, which plans to bring one visible modern art project in Helsinki each year. I hope the next projects will also include public participation in a way or another and be as inspiring as this one! For the last couple of weeks there has been enough snow for skiing also in southern Finland, including Helsinki where I live. Last winter there was never snow for more than a few days which makes it feel even more special now. 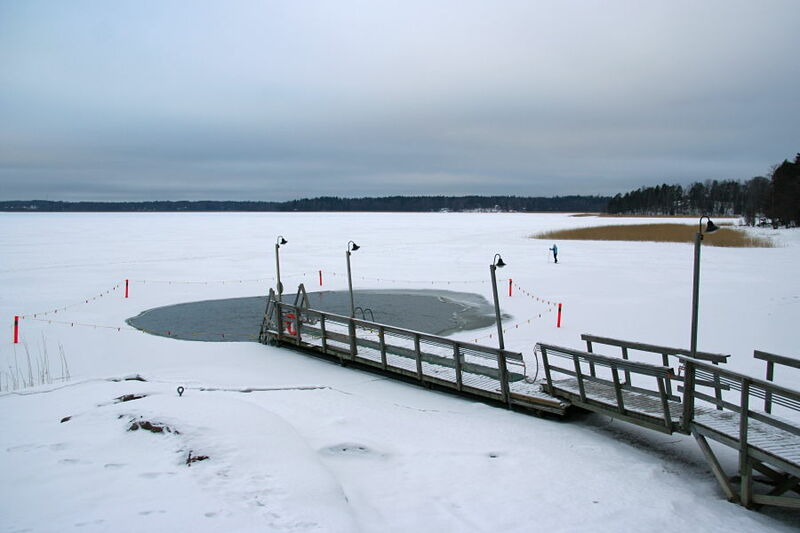 The sea has received a beautiful ice cover which is thick enough to safely ski, skate or walk on. On Saturday I went out for a small cross country ski trip and saw dozens of ice skaters and a few kitesurfers on the Laajalahti bay. One place was kept open for swimmers but the only person next to it was another skier. On Monday I commuted to work on skis, across the same bay. When coming back, the sun had already set and stars were covered by clouds. I had a headlamp, but the clouds reflected surrounding city lights down to the snow so that there was no need to use it. Gliding on the smooth white surface with lots of open space around gave a joyful feeling of escaping the city while being all the time less than 10 km away from the center. Snow and ice are essential elements of winter for me. It's just so much more beautiful and enjoyable than +5°C and rain. If there wouldn't be snow, I might as well move somewhere close to the equator and wear t-shirt and shorts every day. The change of seasons, from green and warm summer days to the cool shades of ice and snow in the winter and back again, is a miracle of nature to be celebrated.